Tony Gilbert's odd Uncle Charlie ends up living with his family, and the two become close when Tony's parents work long hours. The two bond over any number of things, but Charlie is old and dies, leaving money for Tony to attend the Penda School in San Francisco. Tony's parents, wanting a change, find jobs in the city and relocate there. Tony gets accepted into the school after another student, Austin, mysteriously drops out. The principal, Mrs. Foxton, doesn't approve of Jessica, who invites Tony to be part of the Weird History club. She also claims that Tony smells of death, and drags him in to a scheme to get rid of the Penda Boy, the ghost of the founder's son who perished under mysterious circumstances. Tony thinks he sees not only the Penda Boy, but also Uncle Charlie's ghost, and he is soon embroiled in a dastardly plot that puts the very souls of the students in peril. Can he save the day, or will evil triumph? Strengths: Teachers sucking out the souls of students so they can stay young-- that should be fun. I liked the relationship with Uncle Charlie, and the relocation to San Francisco. Even the creepy school was great. Good villains. Weaknesses: This just wasn't written in a creepy way. It should have been creepy and... it just wasn't. Had Mary Downing Hahn written it, it would have scared the bejeebers out of me. What I really think: Will have to think about purchasing it. Depends on how much money I have left in January. 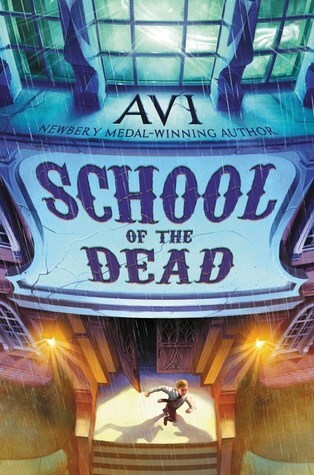 The cover isn't very creepy, and Avi is no longer a popular writer with my students. Interesting that Avi is no longer popular with the students. I don't know what they read today since I've been retired for twenty years. When I was teaching fifth grade, we read Newbery winners and honor books. The kids seemed to enjoy them. I can't recall whether Avi was popular then or not. I need to do some school visits and see what's going on now.